Piers Morgan, the “Good Morning Britain” host who regularly writes on U.S. issues, put singer Mariah Carey in a strange situation during a live interview on Monday morning. Morgan asked Carey about the mass shooting in Las Vegas, which left at least 58 people dead and hundreds more injured on Sunday, Oct. 1. Carey, who had no idea about the extent of the violence, tried to respond. Morgan didn’t appear to know any details himself about the “massive gun attack” and noted that she wasn’t aware before coming on air and being asked for her thoughts, Fox News reported. Carey was slated to appear on “GMB” to discuss her upcoming tour. The theme of the interview then changed when the hosts learned about the shooting at a country music festival in Las Vegas. Carey was sprawled on a sofa with a Christmas tree in the background. Carey didn’t seem to know the extent of the shooting, as the news had just broken. “Horrified to hear about the shooting in #LasVegas. My thoughts are with the victims and their families. Praying for everyone’s safety,” she later wrote in a tweet. 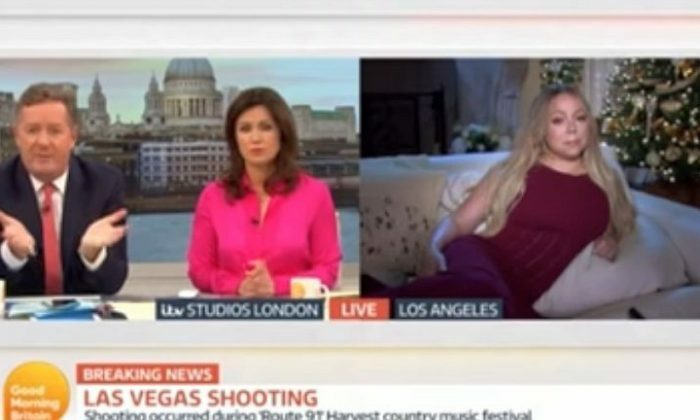 “Shame on @GMB using a pre planned @MariahCarey interview to blind side her about Vegas shooting. Classless tactics & now she’s getting stick,” one person tweeted. “Give Mariah Carey a break. She was on GMB to discuss a Christmas tour not the Las Vegas shooting. It’s not her fault she was blind-sided,” wrote another person. Give Mariah Carey a break. She was on GMB to discuss a Christmas tour not the Las Vegas shooting. It's not her fault she was blind-sided. We told Mariah's people before the interview. “Mariah was booked to do an interview about her UK Christmas tour. Obviously news events in Vegas have now taken precedence,” he added.